America’s trading partners will probably just wait for Trump to move on to his next distraction—which could be a shooting war. UPDATE—3:30 pm: On Tuesday the White House stated that US negotiators had secured some changes in its existing trade agreement with South Korea, with more specifics forthcoming; this was hailed by Trump supporters as a significant victory. The biggest reported gain was that the quota on US auto-company exports to South Korea will be expanded from 25,000 to 50,000—however, since no US manufacturer sold more than 11,000 cars in South Korea in the past year, it’s not clear that this would do anything to create US jobs, especially since the cars in question could be manufactured by US companies anywhere in the world. On the positive side, it doesn’t look like the United States will have a trade war with South Korea any time soon. Especially since South Korea is probably a lot more worried about Trump’s starting a devastating real (and potentially nuclear) war with North Korea. Don’t Be Fooled by Trump’s Tariffs. He’s Running a Con. Talk of trade wars and falling skies has taken up much space in the media since Donald Trump first announced tariffs on imported steel and aluminum on March 1. But such fears are highly exaggerated, which should not be surprising in a country where the benefits of a succession of misnamed “free trade” agreements have been grossly exaggerated for decades. Within weeks of announcing the tariffs, the administration had already exempted most of the major suppliers of steel and aluminum to the United States—including the European Union, Brazil, Argentina, South Korea, and Australia, along with Canada and Mexico. The goods that Trump has threatened with tariffs represent about 3.6 percent of China’s exports, and the tariffs would only cost them a fraction of that. The collapse of the TPP was a remarkable democratic achievement—and rare as a unicorn in US political history: An agreement that every powerful corporate interest as well as the “national-security state” wanted very badly was defeated by mass pressure on US legislators and political candidates. But the prospect of a “trade war” is another story. As far as foreign governments and corporations are concerned, it doesn’t make sense to get into a trade war, or any kind of fight that could cause economic damage, with someone like Trump, who is isolated from his own country’s elite. The leaders of America’s biggest trading partners, including Europe and China, are likely smart enough to wait for Trump to finish his stay in the White House or move on to his next distraction, whichever comes first. 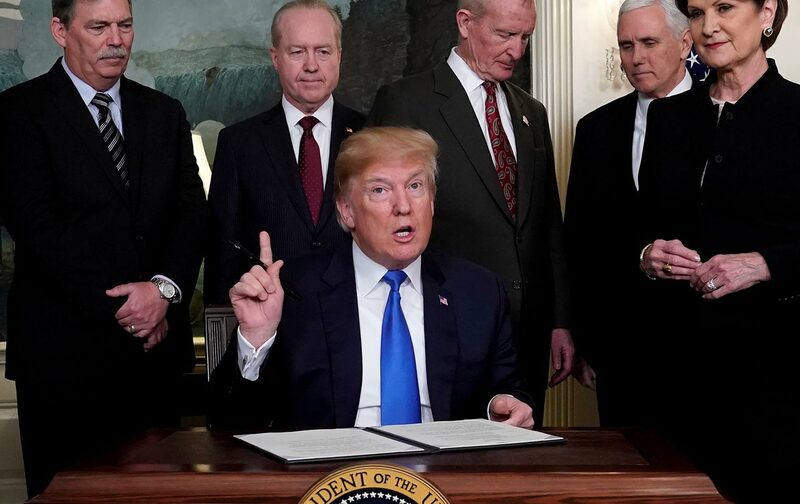 On March 22, Trump threatened China with tariffs on $60 billion of its high-technology exports to the United States. China can certainly afford to wait for Trump’s blustering to subside, even if he follows through on this latest announcement. The goods that Trump has threatened with tariffs represent about 3.6 percent of China’s exports, and the tariffs would only cost the country a fraction of that. In the world recession of 2009, China’s exports fell by 11.3 percent, but its economy still grew by 9.2 percent. If Trump were proposing tariffs as part of a comprehensive set of economic policies intended to create decent-paying jobs and revitalize the US economy, one could at least begin to imagine such tariffs as part of a new trade policy that could stick—and maybe even get Trump reelected. But his proposed infrastructure spending is pitiful—a tiny 0.08 percent of GDP from the federal government. There is no industrial policy in Trump’s proposals, with cuts to nonmilitary federal funding for research and development. It’s all just posturing—more smoke and mirrors. At the same time, Trump-administration officials are negotiating with China about the new tariffs; this is another place where we will need to look at the details. What are they negotiating for? It seems that two of the most important issues are intellectual-property rights and access of US financial firms to Chinese markets. Here we can see that Trump’s “trade” policy—if we look at the main goals and not the erratic tactics—is not so much about trade, and not so different as advertised from the policy of his predecessors. Increasing patent protection for branded pharmaceuticals exported to China might boost profits for Big Pharma, but it is not going to reduce our trade deficit or create jobs in the United States. This is one of the most costly forms of protectionism, increasing prices by hundreds or even thousands of times more than would the Trump tariffs on steel or aluminum. And making it easier for Wall Street firms to sell financial services in China is of little value to all but some of the richest Americans. Trump has been all about weapons of mass distraction; the real danger now is that he will switch to the distraction of weapons as his presidency crumbles—with a real war, not a trade war. His appointment as national security adviser of the extremist John Bolton, who still defends the Iraq invasion and wants to bomb both North Korea and Iran, is an ugly premonition. The same goes for scrapping Secretary of State Rex Tillerson for Mike Pompeo, another advocate of bombing Iran. On Fox News Sunday, Treasury Secretary Steven Mnuchin defended Trump’s acceptance of the omnibus spending bill by saying that “in Iran, in North Korea, in Venezuela, and Russia, all around the world where we’re using sanctions, we need to make sure we have a military that has the necessary resources.” At the same time, Mnuchin offered some soothing comments about trade negotiations with China, which calmed stock markets on Monday. While most of the major media have expressed consternation at Trump’s new “war cabinet,” in the past such sentiments dissipated rapidly once the bombs started falling, as pundits and politicians rallied around the flag. Perhaps the only action that Trump has taken that won him widespread media approval and glory was his bombing of Syria in April of last year. Don’t think he didn’t notice that.